IBM Planning Analytics automates manual, spreadsheet-based planning, budgeting, forecasting, reporting, and analysis. Rapid development and deployment of models without batch processing. Influential Software can ensure your business gets up to speed quickly with on-cloud, on-premise, or hybrid Planning Analytics solutions. 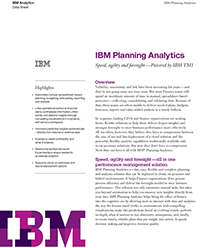 How Will I Benefit from IBM® Planning Analytics?